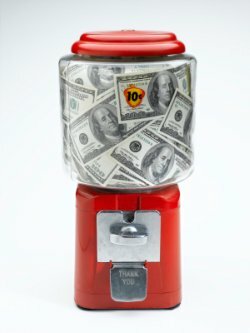 Curious about the 10 rules when starting a vending machine business that can lead to higher profit? Vending businesses are ideal home-based opportunities. Vending is very easy to start. A vending machine business opportunity provides a high return for the time and dollars you invest. 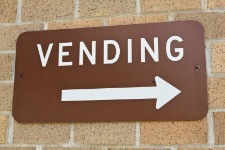 Mass-market retailers and large corporations are not in the vending business. The small businessperson is truly able to generate considerable earnings when they start a vending business. Melissa lives on the outskirts of Omaha, Nebraska and currently has 21 vending locations with a total of 39 machines. Sixteen months ago she found a used candy vending machine for sale on Craigslist for $300. She bought it and placed it in the employee lounge of a 9-person company. Her first month profit was $37. Two months later she had 5 new locations lined up. She went to her local bank for financing. The rest is history. Recently, I spent about two hours on the telephone with her. I asked her what vending business information most helped her in starting a vending machine business and its growth over the past 16-months. RULE ONE: Don’t reinvent the wheel. Her greatest need was to pick-the-brains of entrepreneurs who had been successful in vending. She told me that the ebook published by Chris Robertson was absolutely indispensable. Besides learning the ticks of the vending world, Melissa told me that the experiences and information she got from Chris, saved her from wasting her time, from making mistakes and from spending dollars that were not necessary. She was so proud that she purchased the ebook. She also invested in a vending business plan. Following this business-specific plan impressed her bank. RULE TWO: She always found locations for her machines herself. She would never hire a company or someone else to do this. She stated that vending is a personality-based and relationships build sales and locations. RULE THREE: For the past year she has concentrated on finding locations where there is lots of Generation Y (ages 18-27 years) traffic. Gen Yers like vending machines and, most importantly, are drawn to them by vending machine technology. RULE FOUR: While 9 of her machines lack the latest technology, all of the others do not. Machine technology has gotten her in the door and has led to high traffic locations. Plus machine technology (smart phone and credit card purchases) draws sales and enhances machine reliability. RULE FIVE: Melissa always leases her machines (except for her first one). High tech new machines cost upwards of $3,500 or so. That’s a lot of money. Leasing cuts her profit margin. BUT, her bank will loan her money for leasing and, not at this time, loan her dollars for buying. RULE SIX: In starting a vending machine business, she did so working part time. She figures that when she has around 60 machines in play, she will quit her day job. She continues to do all the stocking of product and collections by herself. She has a contract for machine repair. RULE SEVEN: Only stock machines using brand name products. Stocking with off brands may provide a higher margin but reduces sales a ton. Less profit on some sales is better than more profit on no sales. RULE EIGHT: Melissa would never consider starting a vending machine business buying or leasing, in her case, off brand machines. Buying or leasing from a well established major machine manufacture/distributor provides confidence in machine reliability. This results in more of her time spent finding and servicing her locations and less time fixing problems. RULE NINE: About three months into her business, she decided only to lease vending machines, which have cashless options. She believes such machines nearly double her sales per location and who wouldn’t want that? RULE TEN: In addition to cashless options, she also only leases machines that have a built-in dollar bill accepter. People still carry cash! Melissa is a very bright woman. She started small, sought out knowledge and is growing her company the smart way: one location at a time. As part of my mission to Pay It Forward, I offer to assist you for free as you start any online or offline business. I happily do this to thank all those who have helped me grow as an entrepreneur.